For the last few months, Yael has been telling almost anyone who would listen that she was four. Except she wasn't. Stranger, Friend, Acquaintance: How old are you? Me: Are you really four? But now...finally four. So she's been telling anyone who would listen - not even waiting for the question "how old are you?" She holds up four little fingers (I must take a picture of that) and tells you how old she is. She's very excited about it. She is quite a little four-year-old. Full of energy and opinions, hates to go to bed, loves to pretend with her dolls, has a "teacher voice," does a little tantrum dance when she is angry, carries my phone and keys around and drinks "coffee" (aka juice) from a coffee cup when she wants to play pretend. She loves to boss everyone around, she adores her brothers, and is blissfully happy to be the only girl in the family ("just me and mama!"). P.S. here's what she looked like before. His most recent book is Debt Free for Life , and it's quite a good read. David has really solid, normal advice for how to pay off your debt in a timely manner. His books aren't boring at all, which is high praise for a financial book, don't you think? I think he writes just like he talks, which makes me hear the book in his own voice as I'm reading it. But that's just me. This book had something in it that I don't remember reading in any of his previous books. There's a whole section on "free money" - for real! I kid you not, I went to www.unclaimed.org (don't hit .com, that's a paid site) and I found $270 that I had "overpaid" at an allergist's office in Cincinnati years ago. I haven't mailed the form yet (my printer is out of toner) but that is just amazing. (I also found $16.70 that was owed to my husband. Nice but not nearly as exciting.) Now...I haven't received any money yet. But the thought that I might get that in the mail made me super excited. So, in honor of this fun, I'm giving away a copy of David's new book! Leave me a comment with your favorite money-saving tip and you'll be entered to win a free copy of Debt Free for Life by my cousin! Get an extra entry by sharing this post on Facebook or Twitter. Get one more entry by subscribing to my blog, either via RSS or email (if you're already a subscriber, just let me know that too). Please leave me a separate comment telling me that you did so. Giveaway ends Tuesday, March 1st. Oh, and P.S., speaking of free money, Swagbucks (the best place on the web for free stuff) is turning 3, and they're planning a big celebration for February 28th. If you're not already a Swagbucks user, why not? Sign up here and you get 30 free Swagbucks to start, and then enter this code: 3rdBirthday124 to get an additional 50 in honor of their birthday (good until February 28th). I use Swagbucks every time I buy from LivingSocial, for example, and make it an even better deal! I have earned $25 in Amazon gift cards since I joined Swagbucks in November. Seriously! But none of them really spoke to the way I think of my children and myself as their mother. When we chose our children's names, I was adamant that they be Hebrew names. Not just Hebrew in addition to their English names, but that they be pretty much the same in both languages. We did pretty well, only one middle name that isn't the same in both languages. I ended up ordering some beautiful necklaces for some lovely B'not Mitzvah girls as well, which they loved. It's my favorite thing to wear. A nice quiet week...not much happening. We did have a birthday...but more on that when we have the party in 10 sleeps. Let's just say that the birthday girl has told everyone she meets that she is now 4. It warmed up and before the snow all left, the boys made this snowman. Note that David isn't wearing a coat...now there's a Midwesterner for ya! Who needs a mobile when you have a willing 5-year-old? Friday is Purim Katan, mini-Purim. It's a rare day, it only shows up on a leap year...and this is such! There's not much in the way of observance but I'm thinking extra dessert is in order. I have a friend who doesn't cook. She claims that she can mess anything up. Her son spent the night at my house and I fed him this delicious Ima family favorite. I promised her that she could do it and she laughed at me. So, for my dear friend, here is a picture tutorial of how to make this recipe. While the oven is preheating, put about 2 tablespoons of butter into a 9x13 glass pan, and put that into the oven. Assemble your ingredients - 6 eggs, 1 cup of milk, 1 cup of flour, and 1/2 tsp of salt. Put all those ingredients into the blender. Crack the eggs before you put them in. No shells. Make sure the lid is on the blender before you start it up. Trust me on this one. Once the oven is preheated and the butter is melted and bubbly, take it out of the oven. Swirl the pan so the butter covers the bottom. Pour the blended mixture into the pan. Note my mad photographic skills that I poured and took a picture at the same time. Set the timer for 20 minutes. This is important if you don't have a personal internal timer. Sprinkle with powdered sugar...also good with syrup, jam, or even nutella. See? Easy-peasy. My kids love this for dinner and leftovers reheat well. If there are any leftovers, that is. In fact, this is dinner tonight! 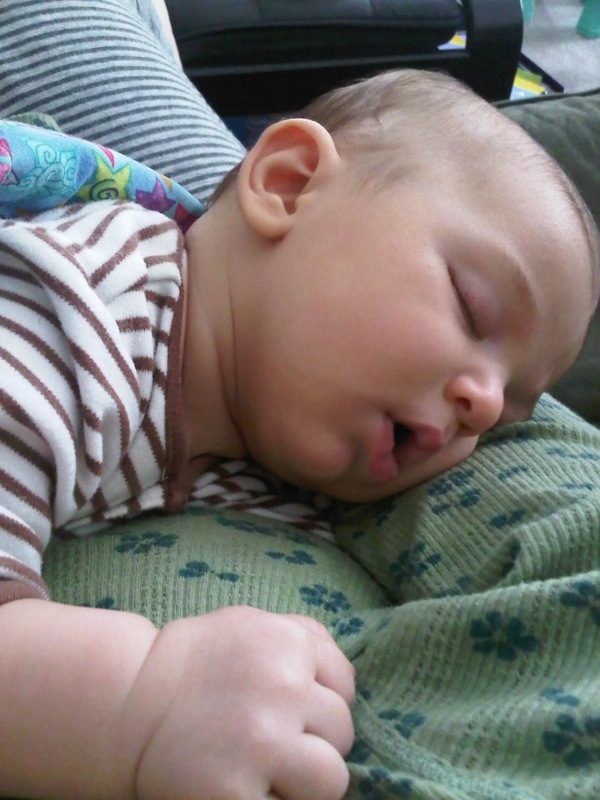 Maternity leave is supposed to have a sense of recuperation? rest? Except with baby #4, not so much. Now, it helps that this baby is lovely. He really is. He sleeps pretty well, he eats great, and he's pretty good with lots of little people poking him and making faces at him and all the other things that big brothers and sisters do. And he's (relatively) happy to be moved around, shlepped in sling or carseat. But there's been a lot of moving. A lot of running around. And not too much sitting still. Part of that is my personality. I hate to just sit. I am always trying to get something done. Part of it is a need to continue the life and routines of the other three children. It's been very cold around here. Even inside the house. While we're waiting for Purim to come, we seem to continue to dance to this song. What's your favorite Purim song? I wish that there were as many Purim albums as there are Chanukah albums. We've done a lot of hanging out and giggling...reading...watching movies...basically, your usual winter hibernation in Chicago! Solly took his first bottle (always a stressful moment for a working mama)...and wait...how did he get to be two months old? I am so excited to bring you this interview with Evelyn Krieger, author of One is Not a Lonely Number , Sydney Taylor Honor Award* win in the older readers category. This book tour is brought to you by the Association of Jewish Libraries (blog at www.jewishlibraries.org/blog), and the official Sydney Taylor Book Awards. The full blog tour schedule will be posted at www.jewishlibraries.org/blog - go see which of my friends are participating and meet some new folks! I've been writing all my life. I always viewed the world in stories and enjoyed telling them. I still have diaries I kept as a teenager. I began writing professionally after starting my teaching career. My first sale was an article to Learning Magazine. First graders give you a lot of material! Initially, I focused on classroom experiences and the teaching of reading, but I couldn't let go of my first love--writing fiction. I continued to write short stories and hone my skills for a long time. Eventually, I had some small successes. Writing a novel remained a life-long ambition. I made two attempts, but didn't finish. What inspired you to write this story? I see from your biography that you are one of six kids, what brought you to a story about an only child? When you are the oldest of six kids, its only natural to occasionally wonder what it's like to be an only child.As part of my preparation for the book, I interviewed only children--both kids and adults. I remember a first grader who wanted a sibling so badly that he invented his mother's pregnancy for show and tell. And I fell for it! I was also inspired to include the theme of Jewish hospitality in my story. This is something I've witnessed first hand. Some people really take the mitzvah to heart and open their home, not just to friends, but to strangers from all over the world who need a place to stay or a shabbat meal. I've had a few readers ask me if there really are people like the Schumachers. I tell them, absolutely! Do you see numbers in the way that Talia does? What brought you to write a story with such a mathematical story line? I don't see numbers in the way that Talia does, but I am fascinated by people who do. I would say I've developed a later-life interest in math. My work as a learning specialist and tutor made me think a lot about why kids struggle with math, or at least, say they don't like it. I wanted to have a female character who is not only good at math, but who thinks about numbers in a very unique way. My young readers have enjoyed this element of the story. The One Is Not A Lonely Number bookmark says, "What color is your favorite number?" I plan to ask that at my book signings and writing workshops. What is your own favorite children's book or books? Charlotte's Web and Horton Hears a Who are two books I never tired of reading to my children. The first Jewish children's book I read was Sydney Taylor's All-of-a-kind Family which my mother bought me at a book fair when I was eight years old. So that adds a special touch to winning this award! Do you read and find inspiration in other authors' work? Definitely. I seem to always read with a third eye, noticing the author's slight of hand, admiring the language. I strive to learn from the masters. I especially enjoy good memoirs like The Glass Castle by Jeanette Walls and Devotion by Dani Shapiro. I see that you're a homeschooling mom as well as a writer. How do you best create a balance for yourself with your writing and your family life? This has been an ongoing challenge since I became a mother. My three kids are teenagers now, so in some ways it has gotten easier to find time to write. Planning ahead for writing time makes me feel less anxious about all those unfinished projects. I write at Starbucks every Sunday afternoon. Getting out of the house to write is important for my concentration. Even though I have a comfortable home, I get too distracted. I also write while my homeschooled daughter is involved with activities and classes. When I have a writing deadline, my family knows that I'll get very cranky if I can't finish on time. They are all very patient and supportive, Shabbat is a regular part of our family life, so that helps give us time to be together without my laptop in sight. Evelyn, thanks so much for participating in the book tour! Mazel tov on your award! May you continue to write and share your stories with the world! One is Not a Lonely Number was a great read. I couldn't put it down! I especially enjoyed the little touches of math that made Talia such a smart character. I love a good "smart girl" book - so important to create those kinds of role models! I recommend this book for any of the "older readers" (probably 4th grade and up) in your life, only children or those with siblings. Follow the rest of the STBA Blog Book Tour at www.jewishlibraries.org/blog! 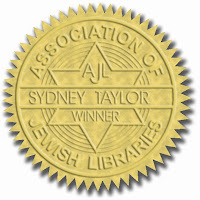 *The Sydney Taylor Book Award is presented annually to outstanding books for children and teens that authentically portray the Jewish experience. Presented by the Association of Jewish Libraries (AJL) since 1968, the Award encourages the publication and widespread use of quality Judaic literature. Gold medals are presented in three categories: Younger Readers, Older Readers, and Teen Readers. Honor Books are awarded silver medals, and Notable Books are named in each category. Thirty-three outstanding books were selected from among the over one hundred and twenty titles evaluated by the Sydney Taylor Book Award Committee during 2010. The Committee recommends them for library, classroom, and home use. List of all 2011 Award, Honor, and Notable Books. me: Sam, what will it take to get you to wear that shirt? Me: How many is a lot? Sam: I changed it. I want 21 quarters. Me: Smart kid. Still done. Go put the shirt on! Lots of time spent hanging out together while it's cold and Ima is on maternity leave...everyone always wants to hold the baby. I hear a lot of "he got to hold him longer than I did!" or "how come David gets to hold the baby but I don't?" We've had snow. Lots of it. Enough to satisfy my children's craving for snow and then some. Snowpalooza 2011....snOwMG. I'm participating in the Sydney Taylor Book Awards blog tour. I had to read the book I was assigned really fast, and it was good. You'll see my review on Monday, along with an interview with the author. The full tour schedule is up here. I've been baking. A lot. It's probably not good for the waistline but it seems to be good for the soul. Today is Rosh Chodesh Adar I. It's a leap year, so we get to celebrate Rosh Chodesh Adar twice. I think it's nice that we add the month of happiness instead of a more crotchety month, don't you? Here's a poem I wrote for Rosh Chodesh Adar last year. Can't wait to make hamantaschen! Solly is 8 weeks old. Where has the time gone? P.S. Did you see my new header? Pretty cute, huh?